With whole home Wi-Fi, you’ll enjoy fast, smooth broadband across your home. So from the dining room to the throne room, the games room and garden, you can. Ready for whole home Wi-Fi? Get a consistent internet experience across your entire home, without worry of dropouts, buffering, or dead zones. Keep all the devices (and people attached to them) happy, no more grizzles about slow internet speeds. Enjoy the internet wherever you want to at home (indoors or outdoors), not where your router let's you. Wi-Fi for every type of kiwi home. Not all homes in New Zealand are built the same, they come in different shapes and sizes and are made with different materials. These differences really impact how great, or not so great, the Wi-Fi coverage in your home is. Whole home Wi-Fi is the answer to making sure that, no matter your house size or make-up, you'll get a consistently strong Wi-Fi throughout your home. Even the backyard. Whole home Wi-Fi increases the coverage of your standard Wi-Fi signal. It uses three units that work together across your home, adapting to large rooms, different levels of a house and standalone buildings like garages and sleep-outs. Allowing the people in your home to use the internet where it suits them best. Our whole home Wi-Fi comes with built-in parental controls and the ability to control when devices can be online. Giving you and your family the confidence to enjoy the internet without worry of unwanted content. The ease of getting set-up and keeping an eye on your home internet use from a handy mobile-app. If you need to keep an eye on usage or put a stop to the internet late at night, you can do it from anywhere using the app. 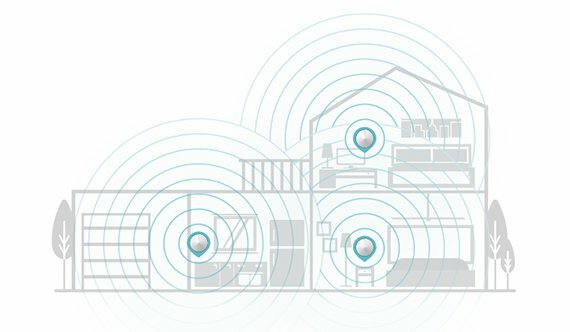 What is whole home Wi-Fi? It’s the new way to get your home, and all the people in it, a great experience no matter where they are. Our whole home Wi-Fi uses 3 small routers, which work together across your home to create an uninterrupted Wi-Fi signal in every corner of every room. It’s easy enough to set-up yourself and manage through a handy mobile app. If you feel like you might need some help, our Techsperts are trained in getting the best set-up for whole home Wi-Fi. Our whole home Wi-Fi comes with family security tools built in. These help you better manage the use of the internet at your place and keep everyone safer online (including the ability to pause the internet, set-up user profiles, filter content and manage the amount of time each person in your home can spend on the internet each day). Would my home benefit from it? If you get frustrated by poor Wi-Fi in parts of your house, or want to use the internet in places your Wi-Fi signal won’t reach (e.g. the shed, garden or back porch) then whole home Wi-Fi is the path to a better home internet experience. Typically, homes that are large, split across levels or have a router in the front of the house when users are mainly in the back of the house, will benefit from whole home Wi-Fi. Or come into our Napier Hub and talk to the team about purchasing one (see our address here). We'd love to have you with us. Simply select the whole home Wi-Fi router when you sign-up. Alternatively you can purchase the TP-Link Deco or Amplifi routers from our online store. If you don't have the time or patience to set it up yourself, then book one of our techsperts to come out and do it for you. They'll connect all your devices and ensure you're getting the speeds you should. OK, so tell me some of the technical bits. We’ve partnered with a global leader in home technology, TP-Link, offering their Deco router to deliver you a reliable connection. The full info sheet for the router can be found here. We offer AmpliFi's Mesh System too. This whole home Wi-Fi solution has mesh points that plug directly into the power mains. Ready for better Wi-Fi? Sign-up to NOW and select our whole home Wi-Fi router. What other routers do you sell? Check out our routers page to learn more about the routers we offer. Tiny house or mansion, we've got a router to suit.